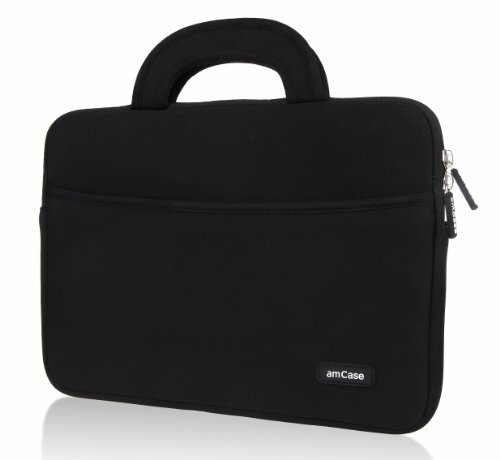 Introducing the amCase 11.6-inch Neoprene Case . . . This protective, neoprene, cushioned case snugly conforms to your devices shape, while the padded texture cushions it like bubble wrap. The material helps absorb shock from dings and bumps, while withstanding daily wear-and-tear. The case also touts a scratch-resistant inner lining to help keep your device's screen looking pristine. Additional storage space in the front is convenient for cables, adapter and other accessories. Slim-line design and handle allow this case to be carried solo or fit in your favorite bag. Compatibility-Specifically designed as a case / sleeve / bag for all 11.6 to 12 inch laptop computers, this works as a great Chromebook case, as well as a Macbook sleeve, Netbook case and Tablet case. Modern Design-A seamless wrap of Impact Foam padding provides top to bottom protection, and the convenient carrying handle makes this case easy to take with you on the go.